German-American farmer John Meints of Minnesota was tarred and feathered in August 1918 during World War I for allegedly not supporting war bond drives. 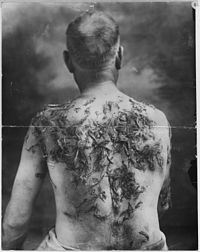 Minnesota historians have cited this incident as an example of nativism and anti-German sentiment in Minnesota during World War I.
Tarring and feathering is a form of public torture and humiliation used to enforce unofficial justice or revenge. It was used in feudal Europe and its colonies in the early modern period, as well as the early American frontier, mostly as a type of mob vengeance. The victim would be stripped naked, or stripped to the waist. Hot wood tar was then either poured or painted onto the person while they were immobilized. Then the victim either had feathers thrown on them or was rolled around on a pile of feathers so that they stuck to the tar. The image of the tarred-and-feathered outlaw remains a metaphor for severe public criticism. The earliest mention of the punishment appears in orders that Richard I of England issued to his navy on starting for the Holy Land in 1189. "Concerning the lawes and ordinances appointed by King Richard for his navie the forme thereof was this ... item, a thiefe or felon that hath stolen, being lawfully convicted, shal have his head shorne, and boyling pitch poured upon his head, and feathers or downe strawed upon the same whereby he may be knowen, and so at the first landing-place they shall come to, there to be cast up" (transcript of original statute in Hakluyt's Voyages, ii. 21). In 1696, a London bailiff attempted to serve process on a debtor who had taken refuge within the precincts of the Savoy. The bailiff was tarred and feathered and taken in a wheelbarrow to the Strand, where he was tied to a maypole that stood by what is now Somerset House as an improvised pillory. The Bostonians Paying the Excise-Man, 1774 British propaganda print that depicts the tarring and feathering of Boston Commissioner of Customs John Malcolm. This was the second time that Malcolm had been tarred and feathered. In 1766, Captain William Smith was tarred, feathered, and dumped into the harbor of Norfolk, Virginia by a mob that included the town's mayor. A vessel picked him out of the water just as his strength was giving out. He survived and was later quoted as saying that they "dawbed my body and face all over with tar and afterwards threw feathers on me." Smith was suspected of informing on smugglers to the British customs agents, as was the case with most other tar-and-feathers victims in the following decade. The practice appeared in Salem, Massachusetts in 1767, when mobs attacked low-level employees of the customs service with tar and feathers. In October 1769, a mob in Boston attacked a customs service sailor the same way, and a few similar attacks followed through 1774. The tarring and feathering of Customs Commissioner John Malcolm received particular attention in 1774. Such acts associated the punishment with the Patriot side of the American Revolution. An exception occurred in March 1775 when a British regiment inflicted the same treatment on Thomas Ditson, a Billerica, Massachusetts man who attempted to buy a musket from one of the regiment's soldiers. There is no known case of a person dying from being tarred and feathered in this period. During the Whiskey Rebellion, local farmers inflicted the punishment on federal tax agents. Beginning on September 11, 1791, western Pennsylvania farmers rebelled against the federal government's taxation on western Pennsylvania whiskey distillers during the Whiskey Rebellion. Their first victim was reportedly a recently appointed tax collector named Robert Johnson. 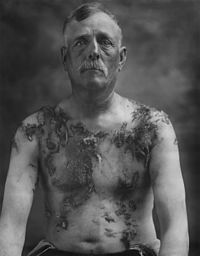 He was tarred and feathered by a disguised gang in Washington County. Other officials who attempted to serve court warrants on Johnson's attackers were whipped, tarred, and feathered. Because of these and other violent attacks, the tax went uncollected in 1791 and early 1792. The attackers modeled their actions on the protests of the American Revolution. Joseph Smith, founder of the Latter Day Saint movement, was dragged from his home during the night of March 24, 1832 by a group of men who stripped and beat him before tarring and feathering him. His wife and infant child were knocked from their bed by the attackers and were forced from the home and threatened. (The infant died several days later from exposure.) Smith was left for dead, but limped back to the home of friends. They spent much of the night scraping the tar from his body, leaving his skin raw and bloody. The following day, Smith spoke at a church devotional meeting and was reported to have been covered with raw wounds and still weak from the attack. In 1851, a Know-Nothing mob in Ellsworth, Maine tarred and feathered Swiss-born Jesuit priest Father John Bapst in the midst of a local controversy over religious education in grammar schools. Bapst fled Ellsworth to settle in nearby Bangor, Maine, where there was a large Irish-Catholic community, and a local high school there is named for him. 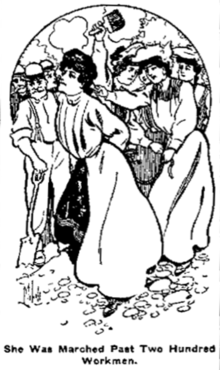 Image accompanying story of "Female Whitecaps Chastise Woman" from Ada Evening News November 27, 1906. The article describes an incident in East Sandy, Pennsylvania where four married women tarred and feathered Mrs. Hattie Lowry. Tarring and feathering was not restricted to men. The November 27, 1906 Ada, Oklahoma Evening News reports that a vigilance committee consisting of four young married women from East Sandy, Pennsylvania corrected the alleged evil conduct of their neighbor Mrs. Hattie Lowry in whitecap style. One of the women was a sister-in-law of the victim. The women appeared at Mrs. Lowry's home in open day and announced that she had not heeded the spokeswoman and leader. Two women held Mrs. Lowry to the floor while the other two smeared her face with stove polish until it was completely covered. They then poured thick molasses upon her head and emptied the contents of a feather pillow over the molasses. The women then marched the victim to a railroad camp, tied by the wrists, where two hundred workmen stopped work to watch the spectacle. After parading Mrs. Lowry through the camp, the women tied her to a large box where she remained until a man released her. Three of the women involved were arrested, pleaded guilty and each paid a $10.00 fine. There were several examples of tarring and feathering of African Americans in the lead-up to World War I in Vicksburg, Mississippi. According to William Harris, this was a relatively rare form of mob punishment to Republican African-Americans in the post-bellum U.S. South, as its goal was typically pain and humiliation rather than death. During World War I, anti-German sentiment was widespread in the United States and many German-Americans were attacked. For example, in August 1918 a German-American farmer, John Meints of Luverne, Minnesota, was captured by a group of men, taken to the nearby South Dakota border and tarred and feathered – for allegedly not supporting war bonds. Meints sued his assailants and lost, but on appeal to a federal court he won, and in 1922 settled out of court for $6,000. In March 1922, a German-born Catholic priest in Slaton, Texas, Joseph M. Keller, who had been harassed by local residents during World War I due to his ethnicity, was accused of breaking the seal of confession and tarred and feathered. Thereafter Keller served a Catholic parish in Milwaukee, Wisconsin. A week before the 1919 Australian federal election, former Labor MP John McDougall was kidnapped by a group of about 20 ex-soldiers in Ararat, Victoria, and subsequently tarred and feathered before being dumped in the town's streets. He had earlier been revealed as the author of an anti-war poem that was perceived as insulting Australia's soldiers. Six men were charged with inflicting grievous bodily harm, but pled down to common assault and were fined £5 each. Many newspapers supported their actions. A group of black-robed Knights of Liberty (a faction of the KKK) tarred and feathered seventeen members of the Industrial Workers of the World (IWW) in Oklahoma in 1917, during an incident known as the Tulsa Outrage. In the 1920s, vigilantes were opposed to IWW organizers at California's harbor of San Pedro. They kidnapped at least one organizer, subjected him to tarring and feathering, and left him in a remote location. The Wednesday, May 28, 1930 edition of the Miami Daily News-Record contains on its front page the arrests of five brothers (Isaac, Newton, Henry, Gordon and Charles Starns) from Louisiana accused of tarring and feathering Dr. S. L. Newsome, who was a prominent dentist. This was in retaliation for the dentist having an affair with one of the brother's wives. Similar tactics were also used by the Provisional Irish Republican Army (IRA) during the early years of the Troubles. Many of the victims were women accused of sexual relationships with policemen or British soldiers. In August 2007, loyalist groups in Northern Ireland were linked to the tarring and feathering of an individual accused of drug-dealing. ^ Welter, Ben (2015-11-18). "Nov. 16, 1919: Tarred and feathered". StarTribune.com. Retrieved 2017-09-19. ^ Alam, Ehsan. "Anti-German Nativism, 1917–1919". MNopedia. Minnesota Historical Society. ^ "Tar and Feather. The American Heritage Dictionary of Idioms by Christine Ammer. Houghton Mifflin Company". Dictionary.reference.com. 1997-05-26. Retrieved 2012-03-07. "Tars. The Free Online Dictionary". Thefreedictionary.com. Retrieved 2012-03-07. "To criticize severely and devastatingly; excoriate." ("to excoriate" [i.e. "to flay"] being itself a similar type of metaphor). ^ "Letters of Governor Francis Fauquier" (1912). The William and Mary Quarterly. 21. pp. 166–67. ^ Campbell, Thomas (1913). "John Bapst". In Herbermann, Charles (ed.). Catholic Encyclopedia. New York: Robert Appleton Company. Retrieved December 17, 2008. ^ "Nov. 16, 1919: Tarred and feathered". StarTribune.com. Retrieved 2012-03-07. ^ Bills, E. R. (October 29, 2013). Texas Obscurities: Stories of the Peculiar, Exceptional and Nefarious. "Father Keller": Arcadia Publishing. ISBN 9781625847652. ^ King, Terry (1983). "The Tarring and Feathering of J. K. McDougall: 'Dirty Tricks' in the 1919 Federal Election". Labour History. 45: 54–67. ^ Chapman, Lee Roy (September 2011). "The Nightmare of Dreamland This Land". Retrieved September 1, 2011. ^ Theroux, Paul (February 13, 2011). "This was England". The Observer. London. ^ "Belfast man tarred and feathered". London: BBC News Online. August 28, 2007. Retrieved August 28, 2007. This article incorporates text from a publication now in the public domain: Chisholm, Hugh, ed. (1911). "Tarring and Feathering" . Encyclopædia Britannica. 26 (11th ed.). Cambridge University Press. Wikimedia Commons has media related to Tarring and feathering. This page was last edited on 17 April 2019, at 17:27 (UTC).